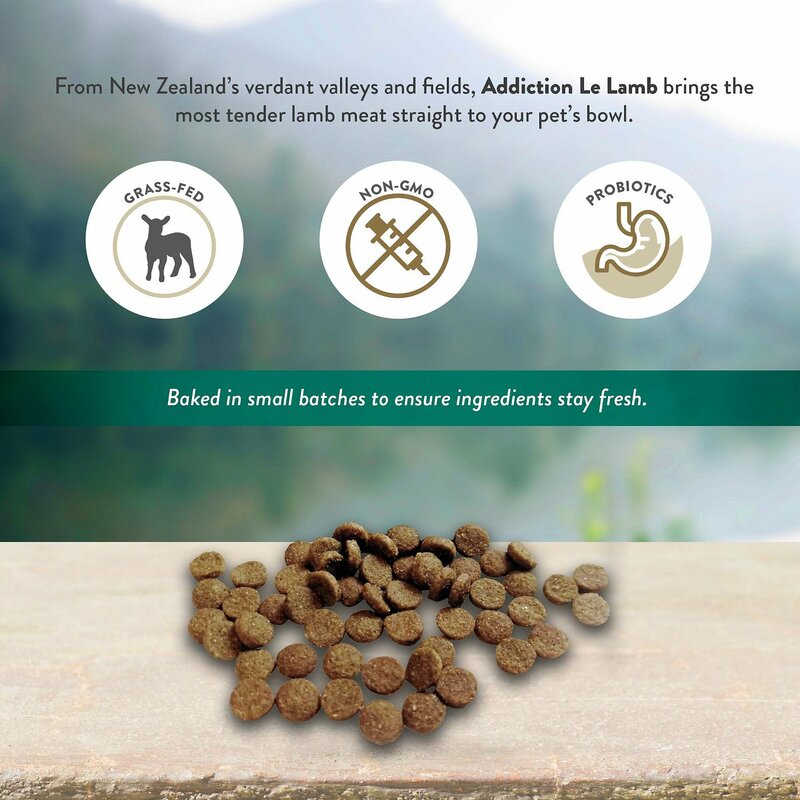 Serve up mouthwatering nutrition with the Addiction Grain-Free Le Lamb Dry Dog Food. Starting with the most tender, free-range lamb from the pristine pastures of New Zealand, this hypoallergenic formula is free from protein that contains hormones and steroids. But what it does have is plenty of probiotics and the antioxidant goodness of juicy berries, which is great for a healthy digestive and immune system. It’s topped off with the aromatic scent of rosemary and chamomile, which entices your dog to dig into the wholesome goodness. 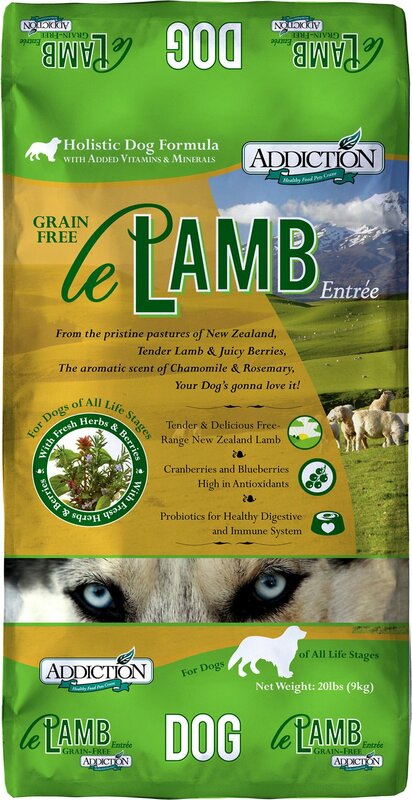 Made with free-range New Zealand lamb that is free from hormones and steroids. All-natural, grain-free recipe has fruits and vegetables that are high in antioxidants and rich in phytonutrients. Also includes probiotics for a healthy digestive and immune system, plus fish oil for a healthy skin and coat. Rosemary and chamomile add an aromatic scent that makes it irresistible to dogs. Made in New Zealand with no corn, fillers, soy or wheat or artificial colors or flavoring. Lamb Meal, Potatoes, Peas, Fish Meal, Tapioca, Chicken Fat (Preserved with Mixed Tocopherols), Flaxseed, Natural Flavor, Fish Oil, Sodium Chloride, Dried Cranberries, Dried Blueberries, Turmeric, Brewers Dried Yeast, Chamomile, Peppermint, Dried Enterococcus Faecium, Dried Lactobacillus Acidophilus, Dried Bilidobacterium Longum, Dried Bifidobacterium Thermophilum, Vitamin E Supplement, Niacin (Vitamin 133), Calcium Pantothenate (Vitamin B5), Vitamin A Supplement, Thiamine Mononitrate (Vitamin B1), Riboflavin Supplement, Pyridoxine Hydrochloride (Vitamin B6), Vitamin B12 Supplement, Vitamin D3 Supplement, Folic Acid (Vitamin B9), Taurine, Choline Chloride, Magnesium Sulfate, Zinc Sulfate, Ferrous Sulfate, Calcium Carbonate, Copper Sulfate, Manganese Sulfate, Calcium Iodate, Cobalt Sulfate, Sodium Selenite, Green Tea Extract, Rosemary Extract and Spearmint Extract. 'Feeding Addiction's Le Lamb Formula for the first time? Mix increasing amounts of Addiction's Le Lamb with decreasing amounts of the old food over a 7 day period. When supplementing with canned food, decrease the amount of dry food to avoid overfeeding. Addiction has created gourmet meals for your pet using unique ultra - premium meat sources such as Brushtail, Venison and Eel in first - of - its - kind flavors - Brushtail & Vegetables, Venison & Apples and Unagi & Seaweed. Our food is ideal for fussy eaters or for those who are allergic to chicken, beef or lamb, and make delicious alternatives to regular pet food.Addiction also uses a holistic and hypoallergenic pet food formula free from harmful fillers, additives and preservatives that are commonly used in most commercial pet food. Only natural ultra - premium meat, fresh vegetables, vitamins and supplements are incorporated to give your pet a natural, delicious nutritionally balanced meal. What does the Earth - Friendly Logo mean? 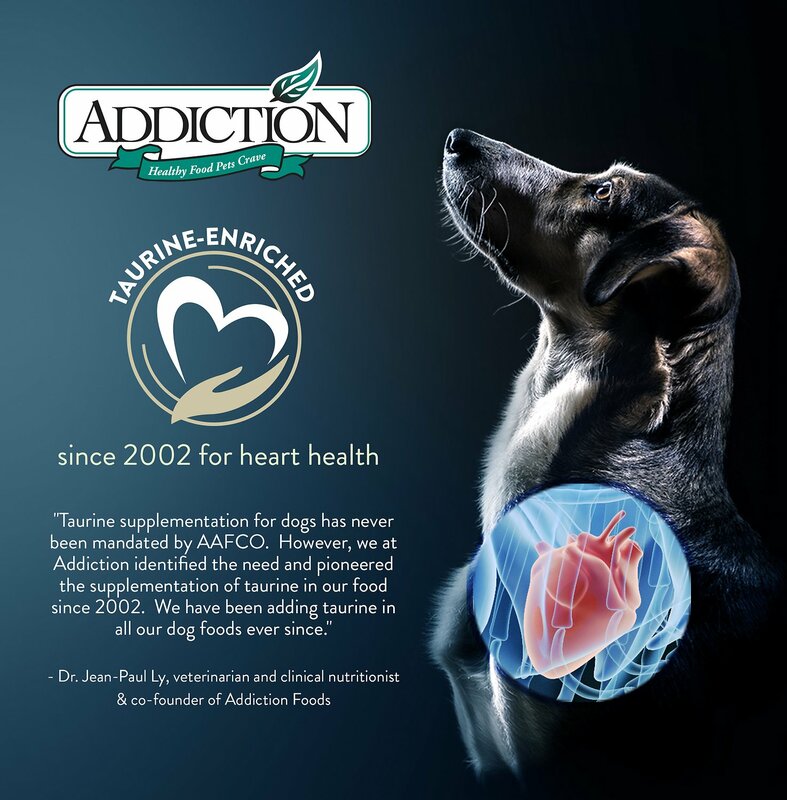 Addiction believes in creating responsible foods that are great for your pets as well as for the environment. We are the first pet food company to pioneer the use of Eco - friendly meats in our efforts to contribute to eco - sustainability. For example, we harvest kangaroos and brushtails, which are considered major agricultural pests, as an alternative to farming traditional meat sources which contribute to deforestation and destruction of the ozone layer. We source only from suppliers that employ sustainable and ethical practices, in line with our eco - friendly philosophy. How can I find out more about Addiction? The Addiction website is updated regularly and contains product information and useful resources about pet nutrition. Alternatively, you can drop an email at info addictionfoods.com. What is holistic pet food? Holistic pet foods use only the highest quality ingredients in combination with health - enhancing vitamins and supplements. They contain no harmful preservatives, chemicals or fillers that are commonly used in most commercial pet food, and which have been implicated in the worrying increase of pet cancers in recent years. In fact, holistic pet foods have been found to aid in the prevention of pet diseases, particularly skin allergies and digestive problems, and help to enhance the natural lifespan of your pet.Having laid out the benefits of holistic pet food, it is important to note that there is more to the concept of ‘holistic’ than just a natural diet. Your pets’ nutrition should be seen as a component of a holistic lifestyle, which entails embracing a state of complete physical, mental and social well - being. Pets thrive in a clean, nurturing environment, and coupled with good food and veterinary care, will lead a high quality of life. What does novel protein mean? Novel protein sources of Brushtail, Kangaroo, Venison, Eel and King Salmon are used as the meat sources compared to common cuts of chicken, beef and lamb, which pets are commonly allergic to. All other ingredients have also been specially selected due to their low - allergenic properties. Since 2003, Addiction has pioneered the development and formulation of hypoallergenic pet foods, and has now the widest range of protein sources in the market, ensuring nutritional solutions for virtually every cat and dog. Our Food Technologists oversee the sourcing and selection of raw ingredients. Most of our meats are obtained from New Zealand and Australia. We do not source raw materials from China. We select our raw materials suppliers based on stringent quality standards and reputation and conduct regular reviews to ensure that standards are continually met. We are the first company to champion using wild game meats as a superior protein source for dogs and cats. All animal protein sources are wild caught or free range, and are thus free from harmful GMOs and antibiotics. We are also a leader in championing environmentally - friendly manufacturing processes. You may visit www.addictionfoods.com/earth for further information. Furthermore, traceability of all our ingredients is mandatory for our manufacturing plants. All our manufacturing plants have laboratories where in - house testing is carried out. Further testing is then carried out by independent, accredited laboratories. This stringent testing applies to every batch that we produce before exporting our foods. We are in contact with our manufacturing plants on a daily basis to ensure that manufacturing processes and Standard Operating Procedures are followed closely. All these means that our plants follow a HACCP program as required by the authorities. Third - party auditors visit our plants no less than once a month to ensure that set standards are met. What are Omega 3 & 6 Fatty Acids, and what are their benefits for my pet? Essential fatty acids are a form of polyunsaturated fat that are necessary for all pets' good health. However these cannot be synthesized by dogs and cats and must therefore be supplied in their diet.Omega 3 and 6 fatty acids have been found time and again to play a vital role in the management of allergies and inflammatory skin conditions by building up a healthy skin barrier, maintaining healthy coat and skin, supporting the proper development of the nervous system and visual acuity, regulating the blood flow to body tissues, aiding in clotting after an injury, and helping your pets' immune system respond to injury and infection. If my pet has not eaten Addiction before, what is the best way to introduce Addiction to my pet? As with all new foods, gradually introduce Addiction over 6 days to prevent stomach upsets. Feed 20% Addiction and 80% of the old food for first 2 days and gradually increase proportion of Addiction over the next 4 days. By the 6th day you can be confident of feeding Addiction for the rest of your pets' life.It is critical that Addiction is slowly introduced to your pet over the 6 - day period. Not following these guidelines may result in your pet experiencing gastrointestinal discomfort or related symptoms. When I fed Addiction to my pet for the first time, I noticed that my pet passed loose stools. Does this mean that Addiction is not suitable for my pet? Loose stools is a common occurrence if any new food, Addiction or otherwise, is introduced to a pet as it takes about 1 week for your pet to get accustomed to the new food. The feeding guidelines provided for the previous question are useful for those introducing Addiction to their pets for the first time. Why is Canola Oil used in some of the formulations? The choice of oil in our foods is one that we have spent a great deal of time researching. For every oil there are advantages and disadvantages. Of the vegetable oils, Canola oil provides a good balance between stability and good fat profile.While there are oils such as olive oil and walnut oils which are also considered healthy, they are extremely unstable and will oxidize very quickly at room temperature. We have done extensive trials with the different types of animal and vegetable oils. We have trialed sunflower oil, Salmon oil, flaxseed oil and many others. Once again, each of them presented different strengths and weaknesses in our trials. Overall we have found that Canola oil presents the best option for our foods.Canola oil is expensive compared to vegetable oils such as corn, soy, peanut or palm oils and animal fats such as tallow and chicken but we have chosen it because we feel that it is the healthiest option.We only use human - grade canola oil, the same product that you would find in your supermarket. Which are Addiction's grain - free foods? Why is Brushtail meat used and what are its benefits? The estimated 60 - 70 million Brushtails in New Zealand are targeted for control as they pose a threat to the natural habitat of New Zealand wildlife. They eat an estimated 21 - 25 tonnes of native forest per night, and are a danger to native bird species. Although declared an agricultural pest, Brushtail meat is healthy and contains significantly higher levels of Omega 3 & 6 fatty acids than other red meats, which are essential to your pets' health.Addiction works in harmonious partnership with New Zealand to create an industry that provides a unique protein source for all pets while conserving the beauty of the New Zealand natural habitat. Our activities to harvest the Brushtails are fully supported by our Ministry of Agriculture and Forests, and our operation is conservation based and approved by the New Zealand government.By feeding Addiction's Brushtail products: Perfect Summer Brushtail RDF, New Zealand Forest Delicacies RDF, New Zealand Brushtail & Vegetables Entrée Canned Food, Meaty Bites Brushtail Treats, as well as Wild Brushtail & Berries Entrée RDF for cats, to your pet, the benefits are two fold - you are helping to conserve New Zealand's plant and animal life, and at the same time providing your pet with a nutritionally superior meal that promotes wellness and vitality. Is the New Zealand Brushtail farmed or free - ranging and are they free from diseases? Our New Zealand Brushtail is harvested from the wild and are certified free from diseases by the New Zealand Government Veterinarians. Feeding Addiction's Brushtail products: Perfect Summer Brushtail RDF, New Zealand Forest Delicacies RDF, New Zealand Brushtail & Vegetables Entrée Canned Food, Meaty Bites Brushtail Treats, as well as Wild Brushtail & Berries Entrée RDF for cats, helps to conserve New Zealand's plant and animal life by reducing the destruction of native habitat. What is the difference between the New Zealand Brushtail and the American Opossum? Despite the similarity in appearance, the New Zealand Brushtail should not be confused with the North American Opossum (Didelphis Virginian), which belongs to a different marsupial family from a very different part of the world. Only the New Zealand Brushtail is used in Addiction's Brushtail products: Perfect Summer Brushtail RDF, New Zealand Forest Delicacies RDF, New Zealand Brushtail & Vegetables Entrée Canned Food, Meaty Bites Brushtail Treats, as well as Wild Brushtail & Berries Entrée RDF for cats, so you can be sure of premium quality New Zealand Brushtail meat in every can. As always, Addiction stands by the quality of our foods and we are ever - ready to assist any customers who need further information about our foods and to solve any issues that they might face. My furbaby isn't too picky, but I always try and keep him on good food. He gobbles the food up when I put it down, he has no complaints so I don't either! This is a good brand of dog food without the poison ingredients. My dog always looks forward to chow time and looks forward to meal time. Great quality ingredients that you can trust. Both my pup and I are happy with this food. Because of a recent pancreatic disorder, my 1 year old GSD needed food with a specific fiber percentage. Not only does this food fit the parameters, but it has a high nutrient content and (according to my pup) a great taste. Very happy with this product. We haven't even gone through a bag of this yet. But the food seems to be of good quality, and my dogs really like it. We are switching from ACANA because Chewy won't be carrying it anymore, while I would prefer ACANA, Addiction seems to be doing the job so far. I didn't give a whole five stars because the food is new to us. For a short time we were using Taste of The Wild while we searched for another food, my dogs became itchy and pooped way more than what is normal! Addiction seems to have them on track again though and it isn't a problem anymore. My yorkie usually doesn't like kibble and won't even smell it but he loves this stuff. Must have a really good flavor. I have an extremely active 5 year old German Shepherd named Frances that absolutely loves this food! She plays all day with her pals at dog daycare and this food gives her the right amount of energy to keep her lasting all day. I've tried out the Viva La Venison for her but she won't eat it and doesn't even bother to look at her bowl. The grain-free Lamb is definitely her favorite! This is some really good dog food so I will keep her happy and continue to feed her this brand. One of my two golden retriever puppies was having digestive troubles which led to being moved to very expensive Royal Canin Hydrolyzed Protein food, from which we gently weaned her onto the Le Lamb. We couldn't be more delighted. 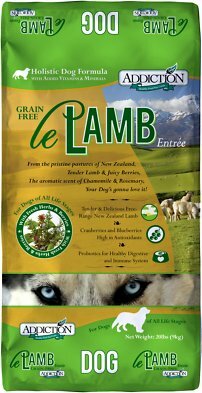 Both dogs really love this stuff - when it gets a bit boring for them, I like to heat a little low-sodium beef stock in the microwave and add a teaspoon of olive oil, then stir it in to their Le Lamb food. They go completely nuts for it, despite both being picky eaters. This is good dog food. I couldn't recommend it more highly, to be candid. Our mini-Aussie really seems to go for this dog food! Shes never really been a big eater, but she can't seem to get enough of this kibble. It smells fresh, but not overpowering and she instantly perks up as soon as she hears the bag. Then, when she smells it, she goes crazy-- you can tell she's really into it. She feels that way about all the Additction dog food she's had though, so I'm not surprised! The ingredients are too notch too, I'd definitely recommend this dog food! I think Chloe prefers the Kangaroo one better so will get that next time but she does eat the lamb but slower than when she has the Kangaroo flavor. Excited to find a kibble without grains or pea products! After trying various brands this is one of the best I have found that does not contain any pea products or grains.